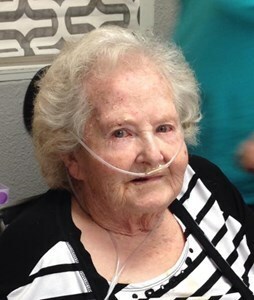 June Ellen Wheeler passed away April 1, 2019 at Central Wyoming Hospice and Transitions after spending most of the day in the caring hands at Wyoming Medical Center. June was born June 2nd, 1921 in Crosby, Wyoming, to John (Scotty) and Anna (Bretthauer) Long. In 1934 the family moved to Riverton, Wyoming where she graduated high school then attended nursing school in Idaho becoming a Registered Nurse. She then joined the Army and as an Army nurse served in the Philippines during the last couple years of WWII. Returning home after the war she met and married the love of her life, Clair Wheeler. They bought a farm in Missouri Valley near Riverton and raised two daughters, Shelley and Bobbie Sue. They were married for 67 years. She was preceded in death by her husband, her parents, her husband’s parents, Charles and Grace Wheeler, one brother John (Jack) Long and his wife, Mildred Long, sister in law, June Marietta, brother in law Jack Marietta, brother in law John Hamilton, son in law Dennis Steinfeld, and great granddaughter, Alma Grace Steinfeld. She is survived by her daughters, Shelley Steinfeld of Glenrock, and Bobbie Van Houten and Loren Van Houten of Casper. She is also survived by her sister, Betty Hamilton, Texas, her brother Robert "Bob" (Joyce) Long, Colorado, and five grandchildren, Brad (Samantha) Steinfeld, Nichole (Dan) Ley, Jamie Steinfeld, Teri Ellis, Brandi (Chris) Byrnes, all of Casper. Plus five great grandchildren, Brandon, Ian, Lochlan, Abbott and Fallyn, and numerous nieces, nephews and other relatives. June will be missed by all. A Funeral Mass will be held 10:30 AM, Monday, April 8, 2019 at St. Patrick's Catholic Church in Casper. A Graveside Service will be held the following day at 1:00 PM, Tuesday, April 9, 2019 at Mountain View Cemetery in Riverton, Wyoming. Add your memories to the guest book of June Wheeler.